We mourn our comrade Ron Champion, 96, who died peacefully on 19 January 2017 at his home in Tiverton. Ron was a lifelong Marxist, Communist and strong supporter of the Daily Worker and its successor the Morning Star. Having grown up in Leeds, he went to Oxford University to read history where he met his future wife Barbara Ackland (who became a sub-editor of the Daily Worker). On leaving the RAF at the end of WW2 he moved to London and married Barbara. He became a journalist and public relations officer for Burroughs Wellcome. Living in West Hampstead, Ron and Barbara campaigned tirelessly for the Communist Party, contesting elections and raising funds for and selling the Daily Worker. On retirement, he and Barbara moved to Essex until Barbara died in 1991 and Ron moved to Tiverton, Devon, to be near his children, remaining politically active until the age of 91. Ron is survived by daughter Anne, son Mike, grandchildren Brendan, Sean, Daniel, Robert and Rebecka and great granddaughter Orlaith. He will be fondly missed by all his family, friends and comrades. At its meeting on Sunday 19 Feb, the SW England and Cornwall District Committee of the Communist Party took a collection of £100 for the Morning Star in Ron’s memory. 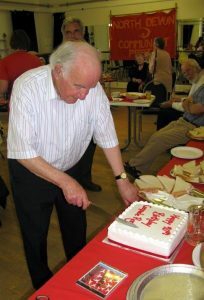 Ron Champion cutting the cake at his 90th birthday celebration. Be the first to comment on "Ron Champion, 1921-2017"